Some more extra days to spend? 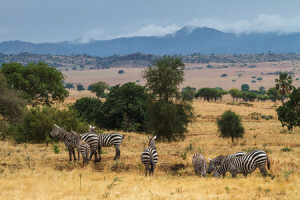 Visit both the northern savannah parks of Uganda in one trip! Kidepo Valley National Park and Murchison Falls National Park are the last original habitats of the endangered Rothschild’s giraffe, also known as the Uganda giraffe. Want to see birds of prey? Kidepo hosts more than 50 species. From the very common yellow-billed kite, the pygmy falcon, fox kestrel and tawny eagle to the rare Verreaux’s eagle and the very rare Taita falcon. Several vulture species can be seen too. On mammals, large herds of African buffalo and bush elephant can be seen easily in Kidepo. With a little luck you will see lions and maybe cheetah. During the game drive to the hot springs of Kanangorok ostriches can be observed in the northern part of the park. After visiting a Karamojong village you will drive to one of the oldest national parks of Uganda, Murchison Falls National Park. During game drives you will watch the abundant wildlife of this beautiful savannah park. See oribis, bush elephants, Ugandan kobs, lions and maybe leopard and spotted hyena. 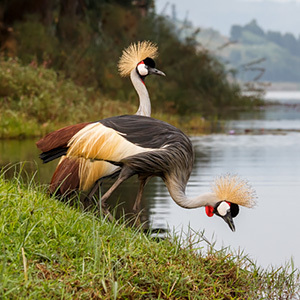 Many bird species can be seen, especially during the boat trip to the Murchison Falls. Some energy left? Hike to the top of the falls and enjoy a stunning view over the park. And don’t worry. Your driver/guide is waiting there for you with the car. And last but not least visit the critically endangered white rhinos in Ziwa Rhino Sanctuary on your way back to Kampala. A trip you will never forget.